Kevork Djansezian/Getty ImagesTesla CEO Elon Musk. Tesla shares were up as much as 4% in early trade on Thursday after the electric carmaker on Wednesday night reported a surprise quarterly profit. In after-hours trade Wednesday night, the stock jumped as much as 12%. 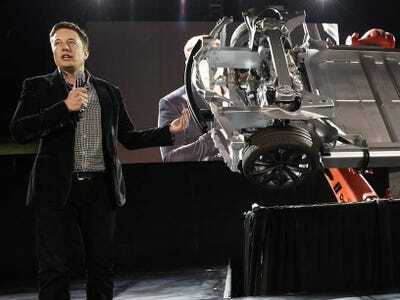 Tesla reported earnings per share of $US0.02, topping expectations for profit of $US0.01. Tesla also reported that in the third quarter it delivered 7,785 Model S vehicles, with revenue for the quarter totaling $US932 million. The real story with Tesla’s earnings report, however, is that the company said it would make 2,000 more Model S sedans than it expected to sell in 2014. As Business Insider’s Matthew DeBord reported Wednesday night, this gap is something that Tesla earlier indicated would show up in its report, and the company expects this production/sales issue to be resolved in 2015 as its California plant adjusts to higher production levels. On Tesla’s earnings conference call, CEO Elon Musk insisted that the company did not have a demand problem, but a production problem. Tesla is one of the most closely followed stocks in the market, and where the stock goes on Thursday after its earnings report will be at the top of the minds of many traders and investors.